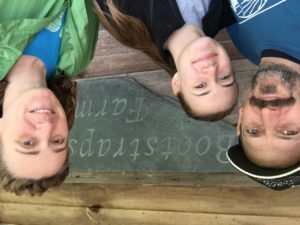 Hi, Bootstraps Farm consists of Michael Buttrill, Caroline Smith, Luna Martin and fifteen and a half acres in the Spring Creek Valley in northern Greenbrier County West Virginia. We have approximately three and a half acres in cultivation for organic vegetables with five thousand square feet of that under plastic. We are completely organic and do not use black plastic mulch, this means that we do a lot more weeding and interacting with our soil than most farmers making a profit from farming. We have integrated Silver Fox rabbits into our operation as of four years ago and are more sustainable because of it. In 2016 our farm suffered heavy losses from the June 23 flood that claimed the lives of twenty three people. Our farm is in the bottomland of the Spring Creek Valley and prone to flooding, but this event was freakish in its’ severity and resulted in approximately fifteen thousand dollars of damage to the farm(read more on that page).